integrated assessment of financial stability and creditworthiness of an individual or entity. The credit rating demonstrates assumptions about the future ability and likelihood of the borrower to make payments (principal and interest) to lenders on time and in full. Credit ratings are usually provided and published by rating agencies or credit bureaus, but lenders can develop their own credit rating systems based on internal data and biases based on the probability of a borrower’s default. Below we will discuss internal ratings systems of lending institutions. A credit rating system, according to the definition from the Basel II Accord, comprises all of the methods, processes, controls, data collection and IT systems that support the assessment of credit risk, the assignment of internal risk ratings and the quantification of default and loss estimates. According to the Dodd-Frank Wall Street Reform and Consumer Protection Act (Dodd-Frank Act), “advanced internal ratings-based system means a Federal savings association’s internal risk rating and segmentation system; risk parameter quantification system; data management and maintenance system; and control, oversight, and validation system for credit risk of wholesale and retail exposures. The credit rating fully reflects the entire amount of credit risk with regard to all payments owed to the holder of the exposure”. These two definitions are rather similar. Both documents recommend using internal ratings-based systems for assessment of the credit risk. The main idea here is the necessity of segmentation of the loan portfolio into separate pools with different levels of the credit risk. The scoring range is divided into several pools and the probability of default is calculated for each score pool. All relevant information must be taken into account. We can often see ratings expressed as letter grades that range. 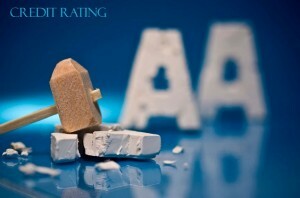 Each rating grade defines a certain level of risk and quantifies loss or default estimates. Starting from AAA group (the highest probability for the loan to be repaid and the best credit rating) the creditworthiness decreases with number of letters (AA is the next group) or next subsequent letter of the alphabet (BBB being worse and so on). However, banks can have their own grading systems, which will follow the same principle. As an illustration of what a credit rating scale may look, let’s consider en example. Incredibly good. The best possible rating for the most reliable and creditworthy clients. Excellent. Not the best, but these clients are likely to repay their loans on time. Really good. The clients are creditworthy, but they may get affected by economic distortions. Good. The level of probability of default is slightly above average or average. Average. Clients have average level of default in the loan portfolio. Fair. Very vulnerable clients that have a high degree of credit risk. Poor. Critical level of credit risk. The chances of default are very high. Exceedingly Poor. The highest level of probability of client’s default. These clients are very likely to default in the future. AAA– Approve automatically. The lender can offer the best interest rate for attracting a client and offer preferable loan terms to attain the client with minimal likelihood of lost revenues. AA– Recommended approve decision. Credit risk associated with the current range is defined as low; applicant’s creditworthiness is consistently high. A– Standard procedure of credit request processing. This is an above average credit score and it should give the borrower easy access to the attractive loan offers. BB– Standard procedure of credit request processing. This is a slightly above average score in terms of repayment risk. Borrower should be approved. B– Standard procedure of credit request processing. Average risk. The borrower may expect to obtain the loan offer with base interest rates and terms. CC– Further consideration of loan request. This is a poor score but the borrower may be worthy based on higher interest rates and/or a shorter repayment schedule of the loan. Borrowers represent a credit risk higher than average. C– Recommended reject decision. Very high likelihood of default and/or loss. Loan approval for potential borrowers in this category is unlikely, and only should be considered based on high interest rates and very short repayment periods. D– Reject automatically. It means that the probability of the borrower’s default is too high. Probability of lost assets and revenues for the lending institution is almost certain.